The climb from the west starts in Innerkrems (1472m) if coming down from the wonderful Nockalmstrasse (Eisentalhöhe (2049m) and Schiestelscharte/Glockenhütte (2029m) or else from Kremsbrücke (952m) on the Katschberghöhe (1641m) road. It is a bit steep for a short while a shortly before the pass, but otherwise it is a rather easy pass. 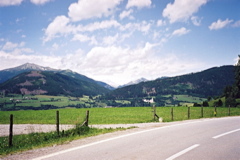 The road goes to 1760m before descending to ca. 1724m and then climbing via the J-Mehrl-Hütte (1730m) to Schönfeld (1741m) and the actual pass looks like it is just after the Hütte. The northern climb is on a very narow road (that is not marked as asphalted on any map I know of, despite that it has been paved for many years now). This climb starts above Pichlern (1091m) or above Thomathal (1046m) at 1129m, depending on which direction you came arrived from. The road descends after ca. 2-3 km around 60m before it starts to climb again. The gradients are moderate. Other comments The pass is very nice on the north side even if it is wooded and there is very little traffic there. Schönfeld is just above some ski resort on the west side and the top section is an open, nice farming area. There are no great views from the pass. I do not have a photo from the nice north side, unfortunately, but the photo I took here is taken just at the start of the northern climb in the north direction away from the pass.